A volcano erupted in the south of Iceland forcing hundreds of people leave the area and diverting flights after authorities declared a local state of emergency. The eruption began shortly before midnight when the Eyjafjallajokull glacier, the island's fifth largest, started to spew smoke and lava from several craters along a rift that is popular with hikers. Police declared a local state of emergency and dispatched teams to rescue about 500 people living in the thinly populated area near the eruption site, but no injuries or damage to property have been reported. Three Red Cross care centres have also been opened in nearby villages to assist the evacuated population. 'The evacuations have gone smoothly,' said local police chief Kjartan Thorkelsson, adding there is no indication the volcano presented any immediate danger to people. 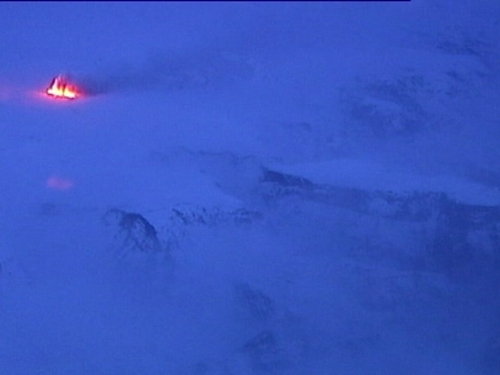 The volcano spewed lava and threw up a plume of smoke about 1km high, but there is little threat of flooding unless the eruption grows in scope and begins to melt large amounts of ice on the glacier. International flights have been diverted away from the island and other flights cancelled due to the risk that possible clouds of ash could interfere with navigation. Scientists in Iceland had been monitoring the Eyjafjallajokull glacier, which has been dormant since 1821, for signs of seismic activity but said there had been little warning of an eruption. 'There was little increased seismic activity prior to the eruption but we did note a few tremors around 2 on the Richter scale - not enough to tell us that an eruption was about to start,' said geophysicist Steinunn Jakobsdotter.